Denmark 3, 1906 Denmark TB Charity Seal, King Christian IX, VF, ph. 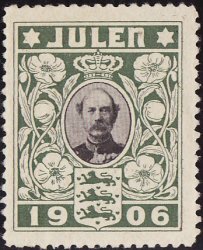 Issued 1906, Danish National Society against Tuberculosis, with image of King Christian IX. Denmark 3, 1906 Denmark TB Charity Seal, VF, ph. Issued 1906, Danish National Society against Tuberculosis, with image of King Christian IX. Frame same as 1904; Green & Black; size: 24x30mm; perf. 111/2. The seal has been lightly hinged - almost impossible to detect - but it's there.